This space is custom designed to meet all the requirements of a dedicated crafter. 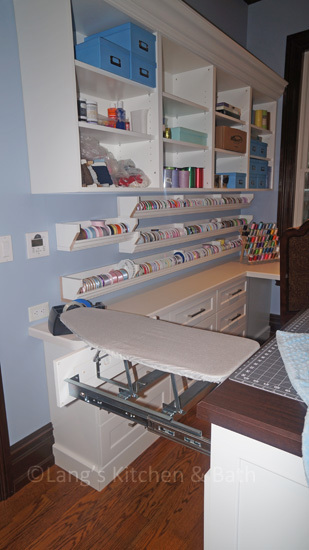 It includes space for two sewing machings, a cutting island, and specialized ribbon roll storage. 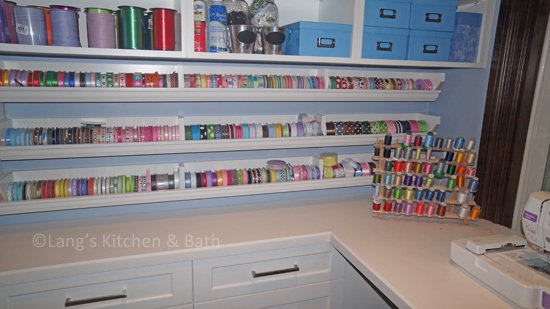 Shelves and drawers throughout the room provide ample space to store fabric and other sewing and craft supplies. This well-designed craftroom means you never have to search for scissors or the right shade of ribbon again, and always have plenty of space to bring all of your craft ideas to life!